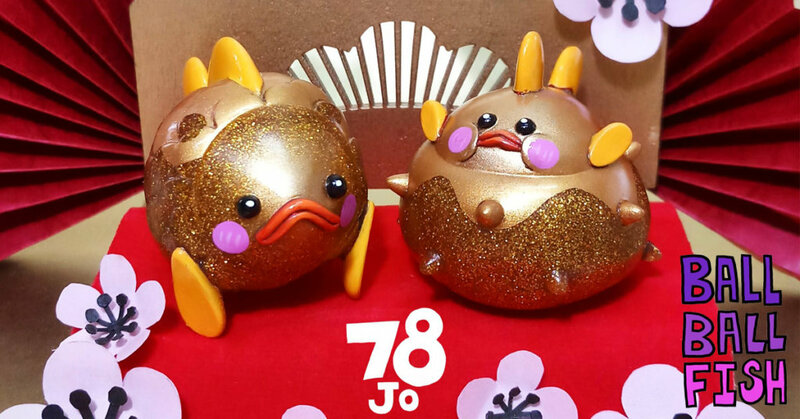 It must be breeding season at 78JO studio as Sunny Tam of 78JO presents the new breed of 波波魚 ballballfish! Its nearly the New Year and what better way to add some sparkle leading up to CNY with New Year Gold Ballballfish. for sale now! Fish (魚) in Chinese pronounced almost the same as”餘”, which means “remain something”. 游魚/有餘(swimming fish/have fish XD) means very likely “have some money left”. That’s why many Chinese would like to have some fish at home! Haha! Message Sunny via Facebook or Instagram. *Contact Toy station or 78JO’s IG/FB while stock last! We want to congratulate Sunny Tam for creating Ballball Fish and showing us there’s nothing to be ashamed about having a round body and rubber lips Ha Ha HA. .